Pantry Staples to Have on Hand -- Be prepared for the dinnertime rush! Some of you who follow the weekly ALDI meal plans have been asking which pantry staples are best to stock up on, so here’s my first stab at a list. Your family’s cupboards of course might differ from mine due to anything from food allergies to personal preferences, though, so take these recommendations with a grain of salt. Which, of course… is on the list 😉 . (Note also that these are pantry staples for meals, not for baking, which would require a whole other set of basics!) Don’t panic: You don’t have to pick up all of these things at once, but just start building up your pantry as you run across sales or have a little extra room in your grocery budget in any given week, so that you start to have the building blocks for so many family recipes. Let’s start with salt, shall we? At a minimum, pick up table salt and a black peppercorn grinder — these McCormick ones go on sale often, or ALDI’s is quite affordable. Next up, what’s really nice to have (and really inexpensive if you keep your eye out) is one big container of basic sea salt. I picked up this sea salt grinder at Costco and it has lasted approximately forever, but you can also pay more for one on Amazon if you’re not a Costco member. 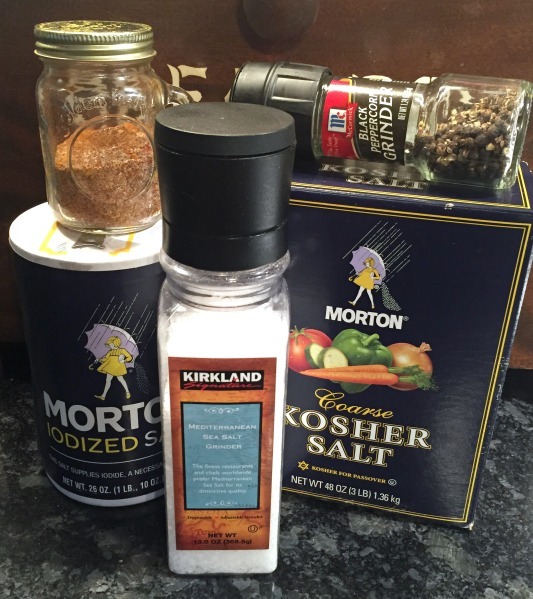 Kosher salt is great for marinades, rubs, and more — and again, with basic family use one box lasts quite a long time. Seasoned salt, I really recommend making yourself! Why so many types of salt? Salt is super important: It works to enhance other flavors, and you’ll want different kinds for different recipes. Seasoned salt, for instance, makes a batch of sheet pan chicken thighs come alive, while Kosher salt works well in recipes like slow cooker salsa pork. Where can you find affordable spices? ALDI has affordable basic spices — $1.19 for conventional and $1.99 for organic, in my area. Buy in bulk from stores like Fresh Thyme, especially when they run sales. Look in the ethnic sections of your local produce stores for more affordable versions of spices that can be quite overpriced in the regular grocery store spice section. Look for coupons around the holidays. McCormick, for instance, often issues high value coupons around Thanksgiving — right around the time stores are putting spices on sale for holiday baking & meals. Dry your own garden herbs. 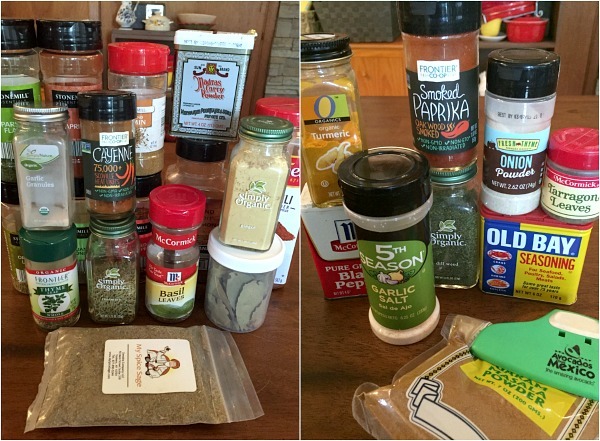 Also keep an eye out on clearance shelves, because it’s always fun to find new seasonings to add to your repertoire. 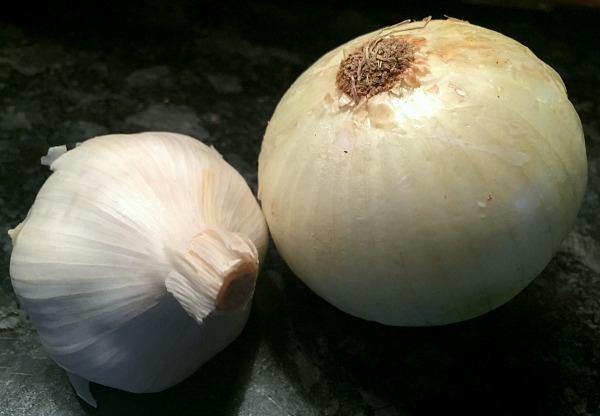 You will always find fresh garlic and onions in my house, because these are the basic building blocks of so many recipes from soup to chili to tacos to chicken. Think about how great your house smells just from sauteing a little garlic and onion on the stove, right? Understand equivalents when it comes to garlic, too: If you don’t like to chop, get a jar of minced garlic and know that 1/2 a tsp of minced garlic = approximately one clove fresh. A good basic all purpose olive oil. I really like Zoe brand tins, which I pick up on Amazon subscribe & save when they go on sale, but Costco’s Kirkland brand is also highly rated — and ALDI’s is very affordable. Balsamic vinegar. Use this in everything from marinades to salad dressings. While we’re talking about vinegar, on the acidic side of things you’ll also want to keep fresh lemons and limes on hand for marinades, salsas, and brightening up various foods. Although these are fresh produce items, they keep for a long time and a little juice often goes a long way — get a few when you see them on sale and they’ll likely last you until the next price drop. For instance: Olive oil + balsamic vinegar + garlic + oregano + sea salt + pepper = basic balsamic vinaigrette. Riff on this with the spices and proportions you prefer, and save money (plus sugar and additives) over buying bottled salad dressing. While we’re talking about produce staples, let’s take it up another notch. 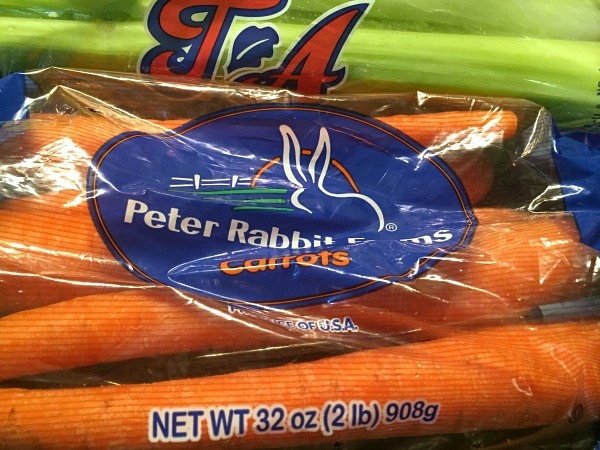 You’ll also always find carrots & celery in my house, because garlic & onion + carrots & celery = the basis for about any soup you might want to make, from chicken soup to smoked sausage & spinach soup. Boxed broth. Start with chicken and/or vegetable; beef is nice to have sometimes, but not necessary. I like to save money and bump up the flavor by making my own, as in this easy veggie broth from scraps, but boxed is useful to have on hand in a pinch. Canned beans. Stock at least kidney beans, some kind of white bean (cannellini, Great Northern), and black beans. If you prefer to cook up your own from dried, though, store up some bags of dried beans instead. Garlic & onion + kidney beans + chili powder + tomatoes = basic chili — which you can then build upon by adding meat, additional spices, jalapeños, and more. Garlic & onion + carrots & celery + broth + white beans + thyme = basic soup — which you can then build upon by adding chicken, additional spices, veggies, and more. 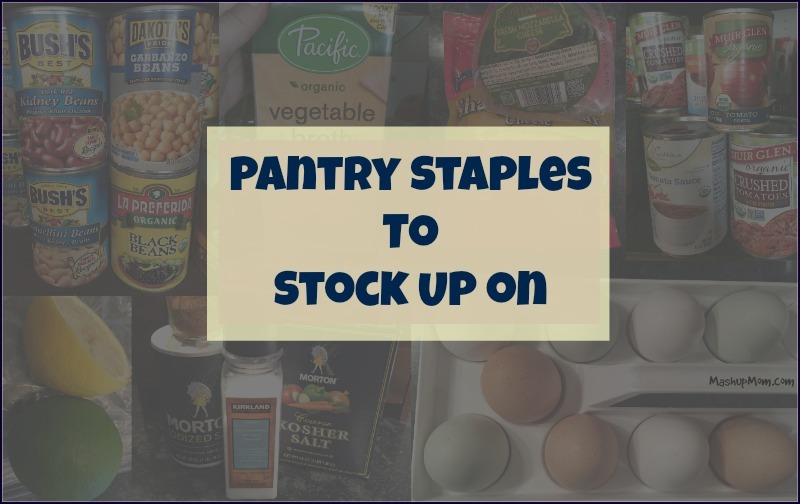 Start to think of your pantry staples as the bases of various meals, which you can build upon in endless variations with the fresh produce and meat items you find on sale in any given week. 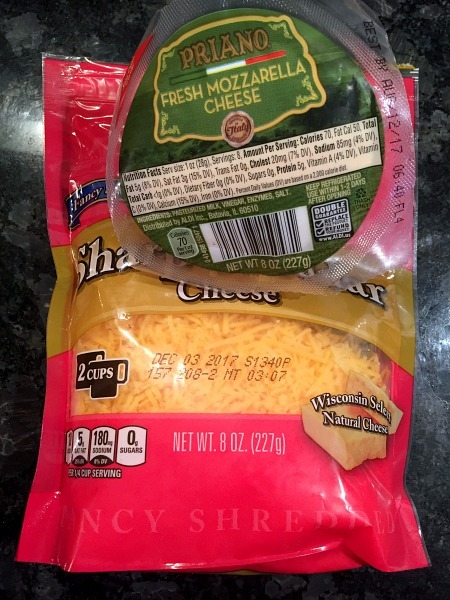 Low carb MashupDad insists we always have various types of cheese in the house, but I’m on board with that, because: Cheese. What goes with cheese? Well yeah… eggs. 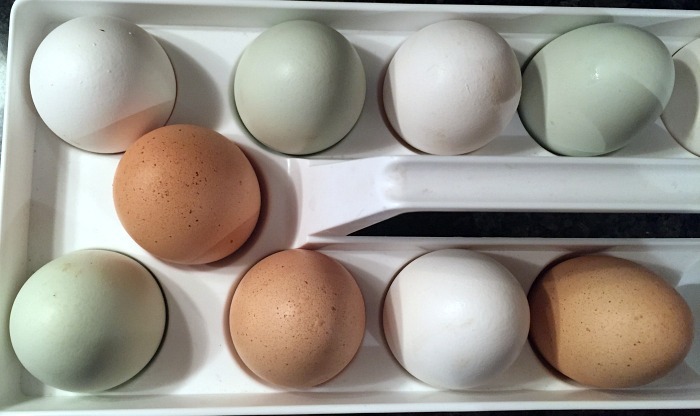 We get ours from our backyard chickens, but eggs are generally affordable and serve as the basis of multiple quick meal options. Once you add eggs, cheese, and carbs to your pantry staples, you all of a sudden have infinite variations on pantry math available to you. 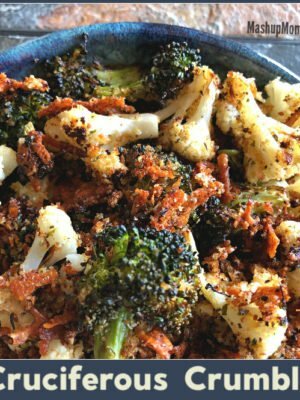 Then you can just add in meat, produce, and additional seasonings to provide an additional pop of flavor — or to transform your staples into another meal entirely. 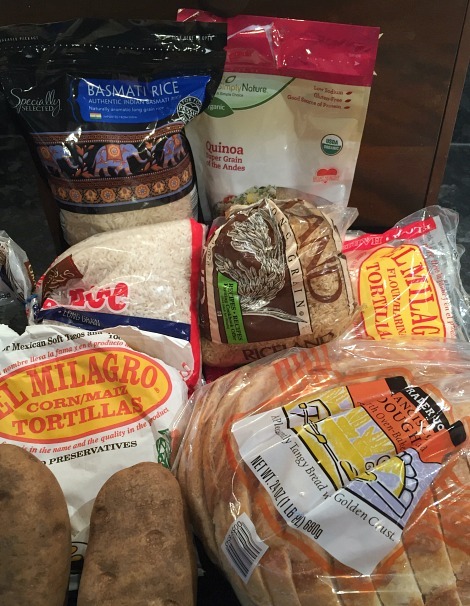 Cheese + tortillas + beans = quesadillas or burritos. Eggs + cheese + butter + bread = breakfast sandwiches, or omelets & toast. Cheese + bread + butter = grilled cheese sandwiches. Potatoes + beans + tomatoes + garlic + onions + chili powder = chili potatoes. Tomatoes + beans + rice = black beans & rice. Have a little soy sauce handy (see below)? Soy sauce + rice + eggs + garlic + onions + carrots = fried rice; sesame oil takes it up a notch. Pasta + cheese + tomatoes + spices + bread + butter + garlic powder + salt = spaghetti & garlic bread. What else do I really like to have on hand? Bread crumbs, tortilla chips. 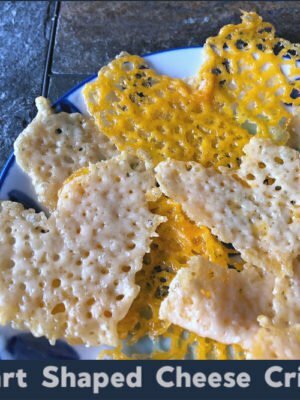 Whether you prefer regular bread crumbs, panko, or tortilla chips, you want the option to bread chicken or fish or to top casseroles, adding crunch and flavor to your recipes. Chili garlic sauce. Because, yum: If you like spicy, this is great in stir fries & marinades. Honey. Add a little to marinades, dressings, and stir-fries to help balance out the spice. Mustard, ketchup, BBQ sauce, mayo. For condiments and marinades; dijon or coarse ground mustard is also a great emulsifier in homemade salad dressings. Nut butters: Buy or make your own (handy guides to making sunflower seed butter and peanut butter) for toast, sandwiches, marinades, dips, and more. Salsa. 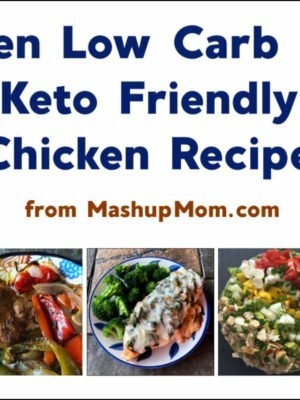 Make burrito bowls or salsa chicken, and much more. Soy sauce. For stir fries, marinades, and fried rice. Sriracha. To add a pop of spice and flavor to stir fries and marinades. Wine. Beyond the obvious: For marinades, pot roasts, deglazing pans, and more. Worcestershire sauce. Because you don’t have to spell it to use it in marinades. Once you’re stocked up on basic pantry staples, the rest is… gravy. 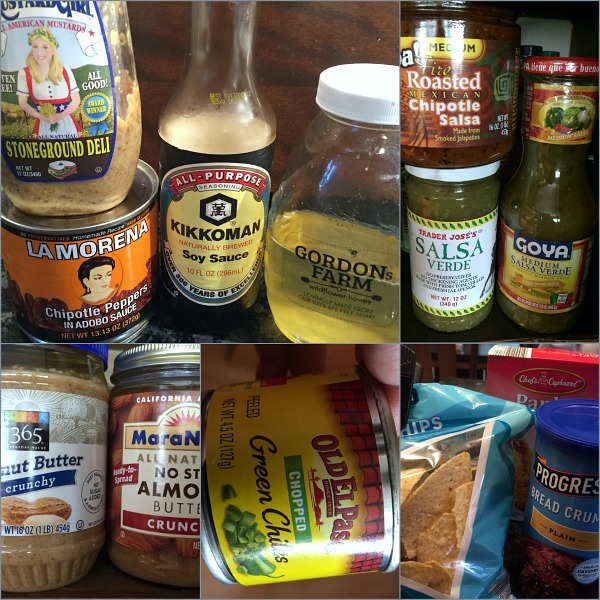 (Although gravy is not one of my staples…) Would your essential pantry picks differ from mine? I’d love to hear your comments! Is spanish paprika the same as smoked paprika? Just curious if you have used. Thanks. Not necessarily, no. Some Spanish paprika is smoked, but not all of it. I guess I have to move to California if I want to grow my own avocado tree—that would be heaven. You can get bulk spices at Whole Foods and I believe Mariano’s. If you can use 4 ounces of spices, you can git some of the ethnic markets on Argyle or Devon. Patel Brothers is supposed to be very good, and they have a store on Devon, and they also have a store in Schaumberg and Skokie and several other suburbs. The Spice House has stores in Old Town, Evanston and Geneva, and they also do mail order. Penzey’s has a store in Naperville and does mail order. Both the Spice House and Penzey’s are constantly rated as having the best spices in the country at Cook’s Illustrated. The owners are brother and sister, and they source from a lot of the same places. At the Spice House at least though you have to buy in one or two ounces increments. I buy the kikkoman less sodium soy sauce, and I really like it. I refuse to use chung king or lachoy. I also always have sesame oil that I use in stir fries. If you use a lot of Asian condiments, you can get them much cheaper at the Vietnamese stores on Argyle. They charge half of what Jewel charges for the same thing. They also have way cheaper tofu. I use worcestershire sauce in the salad dressing that I make from scratch that takes me five minutes to throw together. 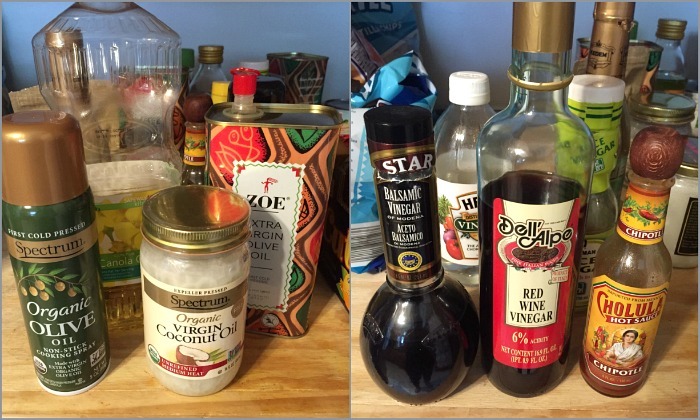 I use two tablespoons of olive oil, two tablespoons of basmatic vinegar, two tablespoons of lemon juice or another vinegar. I usually use rice wine vinegar. I also add a teaspoon of dijon mustard, a few dashes of worcestershire sauce, a crushed clove of garlic, a pinch of salt, and some freshly ground black pepper, and I just shake it together then. I ,much prefer it to store bought. I love Swanson’s Natural Goodness chicken broth, which is Cook Illustrated’s favorite canned chicken broth. When I am using it in soup though, I usually dilute it 50% with water, and it is still just fine. Target usually puts it on sale in the late fall early winter for $.59 or cheaper, and I stock up then. Capers, Durkee’s fried onions, sliced mushrooms in a glass jar..
Love this article! Just found your website and love your suggestions. I’m going to try your Aldi food plan for this week! 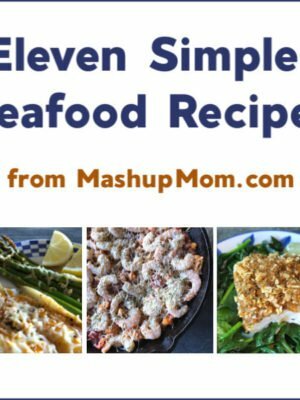 I’m new to food planning and cooking, but love your suggestions. 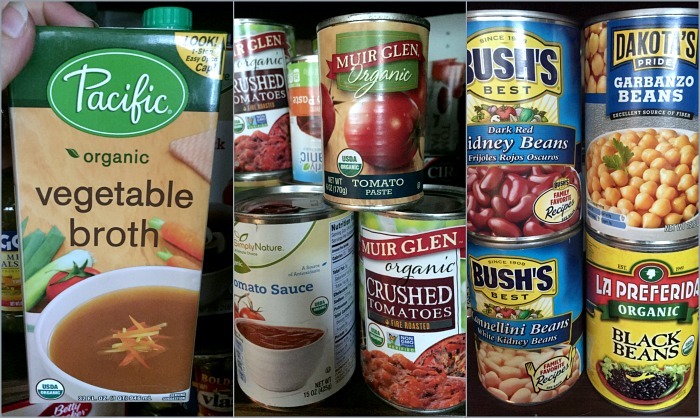 Do you by any chance have a word document or list to take to Aldi for these pantry staples?